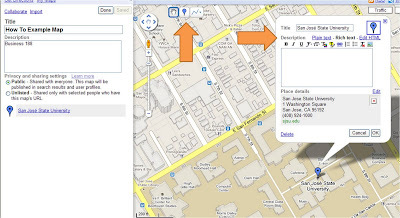 2 Step by Step Guide to Making a Google "My Map"
4 Still confused? Check out this YouTube Video by Google! Google Inc. is one of the most innovative companies in the modern world. While Google can't be credited with the invention of the world wide web, it has undeniably enhanced it. Google started out as a premier internet search engine but now, through acquisitions of other companies along with hiring the best of the best, Google supports numerous aspects of the web including, but not limited to, email (Gmail and AOL), blog (blogger.com), pictures (picasa.com), video (youtube.com), advertising (DoubleClick and AdMob), documents (Docverse among other companies), mobile software (Android) and of course maps! Below is a Google Spreadsheet with all of the acquisitions; information provided by wikipedia.org. Google's headquarters are located at 1600 Amphitheater Parkway, Mountain View, Ca. Their local number is (650)253-0000. It was founded in 1998 by Larry Page and Sergey Brin (Google Corporate Facts Page). They have expanded worldwide and currently have over 50 offices in North America, Latin America, Europe, Asia, the Middle East, Australia, and Africa (Google Offices). 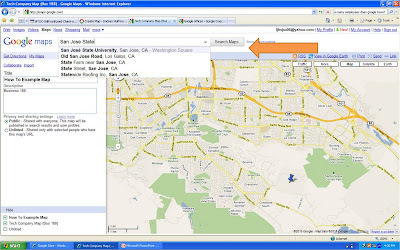 Step by Step Guide to Making a Google "My Map"
Once you log in it will take you to a Google Homepage. There should be a tab for Google Maps near the top of the page, click on it! On the left side of the webpage you will see at the top of the column to choose either "Get Directions" or "My Map." Choose "My Map" as shown below. Once you have clicked on "My Map" it will show you the option to either "Create a New Map" or edit one of your previously made maps. If this is your first map, simply click on "Create a New Map" as shown below. The second picture in the slideshow shows you the form that will appear asking you to fill out the title of your map as well as a description. Google will also ask you if you would like to make the map public, meaning anyone in the world could search for the map and view it, or unlisted, meaning only people that have the URL can view it. If you have personal information in the map (like personal frined's names and addresses) then you may want to leave it unlisted. If your map shows all the places you've visited around the world and you would like to show it off to whomever then you might want to make it a public map. When you are satisfied with these results, click "save." There are a few ways to do this. If you have followed the previous steps then you will want to enter in the address at the top of the screen in the "Search Maps" bar. 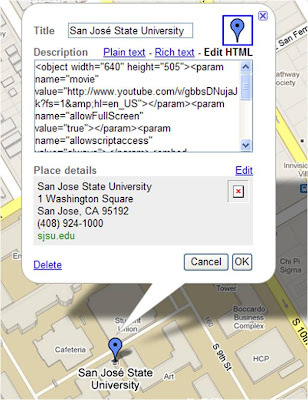 You can either type in an actual, full address OR you can type in a business name or landmark. Google will try to guess what you want to find as shown in the example below. 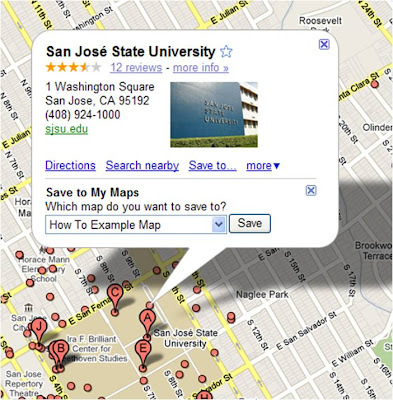 I wanted to locate San Jose State University in San Jose, CA and before I could finish writing it, Google came up with the address. The location should appear on the map with a small icon AND a written description of the location should appear on the taskbar on the left. If you entered in a business name, there may be multiple locations to choose from, lettered with "A" being the most relevant answer, "B" next relevant and so on and so forth. 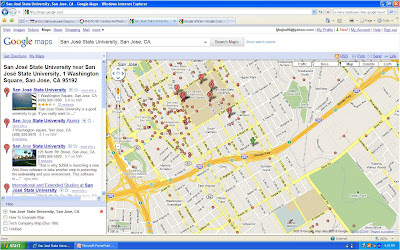 In the example of "San Jose State" I could choose the SJSU location on 1 Washington Square Hall (A), the Alumni Association (B), the location on 125 North 7th Street (C), etc. Click on the letter/icon on the map that you would like to add to your map. I want "A," the Washington Square Hall Location. A small pop up will appear on the map. On the bottom it has various choices, (like "Directions" and "Search nearby"), I want to choose "Save to My Map." A drop down menu will appear in which you can choose your map by title, or create a new one if you haven't done so already. Then click "Save." I want to add this to "How To Ecample Map." 1) Whenever you are searching for a place you can ALWAYS add it to one of your personal "My Map" as long as you are signed in with your Google Account. 2) When you are in editing mode in My Map, you can simply click on the "place marker" icon (shown in Step 6) and place it anywhere on the map! There are MANY things you can personalize once you've added a place! Before you start editing, you must make sure that you are working on your "My Map" in editing mode. 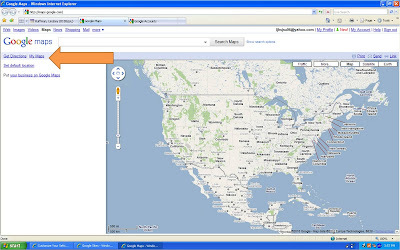 To do this, make sure that your map is highlighted in the task pane on the bottom left of the screen. A hand, place marker, and line button should appear at the top left hand corner of the map, as shown by the first orange arrow. This is how you know you are in editing mode. 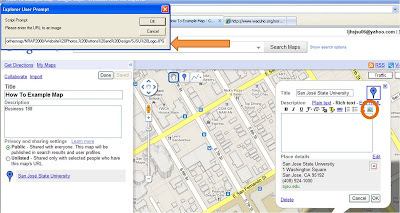 To start personalizing a location, click on the place marker. A box should appear, as shown by the second orange arrow. With this box you can add your own title and description. If you want to just have a simple text descriptiom choose "plain text" and type it in, click "ok." If you want to have more options, click "rich text." A task pane will appear allowing you to bold, italicize, and underline words; change the font type, size, and color; create a link; add bullet points; and even insert a picture. Below I will explain how to add a picture; to use the rest of the formatting options, highlight the words you would like to format and click on the button you would like to use. This works the same as a typical document editing tool such as Microsoft Word, Google Docs, and rich text email. First, you must find the picture you want on the web. A typical scenario would be to start at Google Images, type in a description of the picture you would like, click on the best option, when the website where the picture is on loads, choose "See full picture" on the top of the webpage, and finally copy (ctrl+c)the URL that comes up (you should only see the picture on this page). Watch the slideshow below for more information. Once you have the URL, go back to your Map. On the details pop up click on "rich text" and then click on the picture icon at the end. Your computer may have a warning, click "ok" and then on the top of the webpage click "Temporarily Allow Script." You may have to click on the picture icon again. This time a box will pop up in the upper left hand corner that says, "Explorer User Prompt." Paste the URL into this box and click "ok." Your picture should appear in the description box! You may want to add a video to one of your locations. First you want to find the "Embed" code for your video, or in other words, it must already exist somewhere else on the internet (most likely YouTube.com). Here is how you would find the embed code on YouTube: find the video you would like on your map, click "embed." Below a very long and complex html code will appear. Copy the whole thing! Now, back to your map. On the detail pop up choose "Edit HTML." Paste the embed link into the box. 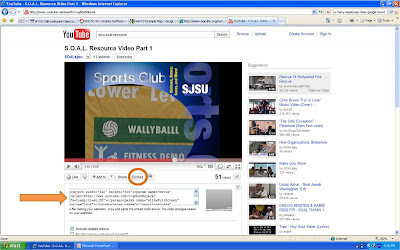 Click "ok" and your video should appear (to view it click rich text)! Warning: do NOT click "plain text" as this may erase all of your formatting and added pictures/videos. Finally, you can customize the icon of your location using one of Google's preloaded icons. For San Jose State, I decided to change my icon to the little green school house (boxed). To do this, simply click on the icon in the upper right hand corner of the description popup and choose the desired icon. You can also add your own icon by pressing "Add an icon." You will follow the same steps as adding a picture to complete this section. You'll be able to find all of the icons you loaded in the "My icons" tab. You have successfully added your first place to your very own map! Make sure to look into all the other things Google Maps can offer you! Still confused? Check out this YouTube Video by Google!